Chromapolis est une ville dans Splatoon et Splatoon 2 habitée par diverses races, notamment les Inklings et et les Méduses. Chromapolis a été créée longtemps après que la Terre a été submergée par la hausse du niveau de la mer et que ses habitants fonciers ont été anéantis. Octopi and squids eventually evolved and began fighting over habitable land in the Great Turf War, inspiring the Turf War sport and Octarian rebellion. La Place de Chromapolis est le hub de Splatoon . À partir de là, les joueurs peuvent accéder à différents types de modes et de magasin ainsi que d'interagir avec d'autres joueurs Inklings qu'ils ont combattu récemment. C'est le cœur de Chromapolis. La place est circulaire avec un grand trottoir et différents magasins sur le côté. À l'arrière se la Tour de Chromapolis dans laquelle les joueurs peuvent entrer pour accéder aux Matchs Classiques et aux Matchs Pro. À gauche de l'entrée principale se trouvent les Galerie Lacrevette, un centre commercial dans lequel le joueur peut acheter de l'équipement. Les boutiques de ce centre commercial sont Ammo Knights, le magasin d'armes, Kamatête, la boutique d'accesoirs, Jelly Fresh, la boutique de vêtements, et Shrimp Kicks, le magasin de chaussures. Each shop has a charismatic Shop Keeper, and each one represents a different type of marine life. Ils sont Cartouche, Anne (et Mone), G.Latineux et Omar. There is also a manhole in the far right corner where Octo Valley is accessed. Other areas include one of the alleyways where Spyke can be found, the Arcade Machine across from the Booyah Base, and the amiibo machine which can be found towards the back. On the second floor is the Battle Dojo and the Inkopolis News Studio. After battling with other players online, their Inklings will temporarily appear in the player's plaza. Their name, level, rank, gear, and Miiverse post (if present) can all be seen by examining them with 28px. From there the player can also order their gear from Spyke. Inkopolis Plaza features two large statues; being a Tanuki and a Fox. The Fox is on top of Booyah Base whereas the Tanuki is on top of the studio for the Squid Sisters. The animals depicted on these statues were the two sides of the second Japanese Splatfest. There are also three speakers, aside from the ones infront of Inkopolis Tower, that play different tunes. One can be found by Booyah Base and the other two can be found to the left and right from the back of the plaza. A concept image showing Inkopolis' manhole connecting to Octo Valley. Inkopolis Tower - Inklings can compete in online multiplayer battle modes. Battle Lobby - Inklings can choose a mode category to play. Octo Valley manhole - Inklings can play Octo Valley singleplayer missions. Arcade Machine - Inklings can play the Squid Jump, Squid Racer, Squidball, and Squid Beatz mini-games. Battle Dojo building (second floor) - Inklings can access the 1v1 local multiplayer Battle Dojo mode. Spyke alley - Inklings can talk to Spyke, who can upgrade gear for Super Sea Snails or Cash. amiibo area - Inklings can play amiibo challenges with the Splatoon amiibo figures. Miiverse mailbox - Inklings can post to the Splatoon Miiverse community. Inkopolis News studio (second floor) - Inklings can see the Squid Sisters' studio. Inkopolis Café - A café located under the Squid Sisters' studio. Pledge Box (during Splatfest) - Inklings can choose Splatfest team. Booyah Base - A local mall comprised of a variety of gear shops. Ammo Knights - Weapon shop run by Sheldon. Shooting Range - A location used by Ammo Knights customers to test weapons. Cooler Heads - Headgear shop run by Annie and Moe. Jelly Fresh - Clothing shop run by Jelonzo. Shrimp Kicks - Shoe shop run by Crusty Sean. 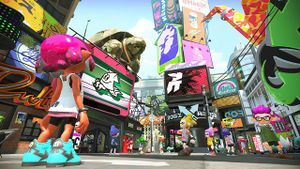 Inkopolis Square is the hub world of Splatoon 2. From here, players can access various types of modes and shops. It is a more modern area of Inkopolis than Inkopolis Plaza. According to the Sunken Scrolls, it would seem Inkopolis exists approximately 12,000 years in the future of current-day Earth after excessive flooding of the planet has occurred. A glitch allows players to go out of bounds in Inkopolis Plaza and explore. The back of the amiibo case can be found. The words are written in Inkling. The layout and design of Inkopolis is based on the city of Shibuya in Tokyo, Japan. A plane will occasionally fly over Inkopolis Plaza suggesting it may be located near an airport. Sometimes when a train stops in Inkopolis Plaza, the Calamari County anthem, Calamari Inkantation, can be heard. The colors of the chairs, Callie and Marie sit on in the studio reflect the ink colors of the player's last match, or the colors of the current Splatfest. The main color is the opponents' color, with arrows in the player's team color. The train that goes around Inkopolis will have a paint job that matches the neutral color value of the player's previous match. These include the colors of barriers, wall tops and other objects. Chromapolis seen when starting Splatoon. An Inkling in the Plaza. Inklings roam around the Plaza. An Inkling runs around the Plaza. Tanuki and Fox statues in the Plaza. Drinks in one of the vending machines in Inkopolis Plaza. A small menu inside the café below the Squid Sisters' studio. A dandelion in the Plaza. The ferris wheel in the distance. Judd sleeping in the Plaza. Concept art of Judd, showing different ideas for how he would laze about in Inkopolis. Concept art of Cap'n Cuttlefish, showing different ideas for his manhole in Inkopolis at the lower left. Concept art of various objects at Urchin Underpass, some of which also appear in Inkopolis Plaza. Chromapolis can be viewed all the way from Octo Valley. Inkopolis Plaza day before a Splatfest. Chromapolis seen when starting Splatoon during a Splatfest. The Plaza's fox statue during a Splatfest. The Plaza's tanuki statue during a Splatfest. Miiverse posts as neon signs in the Plaza during a Splatfest. Animated GIF of the Plaza during a Splatfest. Inklings dancing in the Plaza during a Splatfest. Judd dancing during a Splatfest. The view of Inkopolis from Blackbelly Skatepark during a Splatfest. The view of Inkopolis from Hammerhead Bridge during a Splatfest. haikara shiti Trendy city. (ハイカラ means 'high collar'.) Also a pun on Ika (squid) and color. 20x20px Italien Coloropoli From colore (color) and the Greek word polis (city). La dernière modification de cette page a été faite le 4 août 2017 à 10:07.